Computer hardware upgrade is not that difficult. Lot's of people would rather ask someone else to do it and pay that person. You can easily do it with a little research and help from this page. First of all, you have to ask yourself, what do I need to upgrade and, why do I need to upgrade. Let me first discuss, "Why" you need to upgrade and then we will look at, "What" to upgrade. When you bought your PC or laptop, it was fine for the task at hand. The software you ran on it worked fine at the time. Let me tell you why you upgrade. It's because of software. Yep, believe it or not. It's software. When I bought my first PC, I used it as a music studio to create songs and music on it. The music software I used, at the time, was fine for the spec's of the PC. Then the company that created the software had a string of new versions for their software. My PC could handle the first couple of updates, but after that it just became to slow. They started using more graphics and a new concept called, VST (Virtual Studio Technology) instruments. So, instead of having physical hardware instruments, they created these instruments as software plug-ins, or virtual instruments. This placed a huge load on my aging PC and at some stage I had no choice but to do a computer hardware upgrade. Operating system vendors like, Microsoft also plays a part in the computer hardware upgrade process. They periodically bring out new versions of their operating system which require newer hardware. You could argue that one just need to continue using the old stuff, and you could. But at some stage the OS and software will not be supported anymore. Programs will be harder and harder to find for your old and outdated operating system and hardware. The reason why software companies bring out new versions of their products, is to make it better. Better features, bug fixes and so on. They have to keep ahead of the competition. So, new software needs new and better hardware. That's just how it is. Today's new component, might be old news tomorrow. You might say, "But that's not fair. Where must I get the money to continuously do computer hardware upgrade?". Bill Gates once said, "Life is not fair, get used to it." Don't worry, there is something you can do to make upgrades easier. This brings me to the, "What" to upgrade. When it comes to computer hardware upgrade, you need to know what to upgrade. Before I start with the, "What", lets talk about how we can reduce the number of upgrades needed. You will waste a lot of money if you have to upgrade every time a new piece of hardware comes around. You have to plan your upgrades. When you buy a new PC, check the features of the motherboard to find out which components are upgradable. You will find the specifications and features in the motherboard manual. 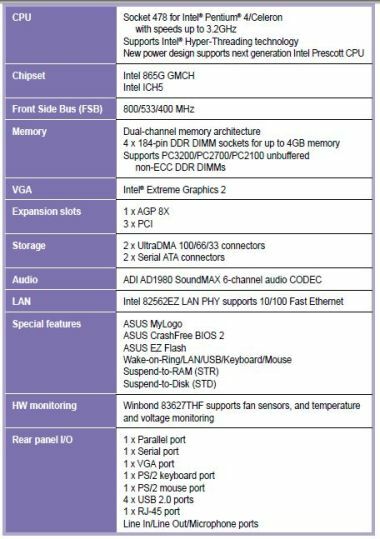 Below is an extract of a motherboard manual. Let's look at the CPU. In this example the motherboard supports up to 3.2GHz socket 478 Pentium or Celeron CPU's. If you have a, let's say, 2.1 GHz CPU installed, then you could upgrade to a faster CPU. You can go up to 3.2GHz. If you have a 3.2GHz CPU installed, then obviously you cannot upgrade the CPU. You would then look at a new motherboard. Take note of the type of CPU. The manual says it supports Pentium CPU's, so don't try to plug an Intel core i5 or i7 in the socket, it won't fit! Let's look at the memory. According to the manual, the motherboard supports up to 4GB, in 4 slots with some speed variations. Again, if you have 2GB installed then you can upgrade to 2GB more. If you already have 4GB, then an upgrade would not be possible. Maybe a motherboard upgrade would be needed. Pay attention to the type of memory. Only DDR1 DIMM's are supported. So, don't go and buy DDR2 DIMM's, they will not fit!. Another thing to note on the memory is the fact that says, use unbuffered, non ECC (Error Correction Code) DDR1 DIMM's. When you buy memory, then do not buy ECC and buffered memory modules. They won't work! Let's look at the disks. According to the manual, you have 2 ultra dma connectors, and 2 SATA connectors. If you already have two IDE (Integrated Driver Electronics) disks installed, then you can easily add two SATA disks that run faster and are probably bigger than the IDE disks. If you already have two SATA disks then you obviously cannot add SATA disks. In this case, if you need bigger and faster disks, it would be better to get a new motherboard. Let's move on to the slots. According to the manual you have 1 AGP x8 slot and 3 PCI slots. If you have a PCI graphics adapter, then you can easily upgrade you graphics adapter with a AGP one which much faster than the PCI slots. Even if you have a AGP card installed, you might want to look at adding a AGP card with more memory on. This would increase the speed of your graphics. Maybe not as much as adding a PCI express card, but it will be better than what you have. The example motherboard manual I used was an old system I had. At some stage I upgraded my music creation software and operating system, and my PC ran slower. I did not have money to for the latest motherboard, CPU or RAM. I had to look at a computer hardware upgrade on my existing system. So, what I did was look at the manual and see what I can do to extend the life of my PC. I already had a fast CPU. I had a Pentium running at 2.8GHz. I tried to find a 3.2GHz CPU, but no one sold it anymore and the ones I found secondhand, were very expensive. I also thought that the jump from 2.8 to 3.2 GHz would not make much of a difference. So, I skipped the CPU computer hardware upgrade. I only had 1 GB of RAM installed in the form of 2 512MB modules. I checked some prices of DDR1 DIMM's and bought 4 1GB DIMMS for a good price. So, I bumped my memory up from 1GB to 4GB. I then checked my disks. I had 2 IDE disks. One was 40GB and the other 80GB. I checked some prices and sizes and bought a 320GB SATA disk for next to nothing. Disks are dirt cheap these days. Just check the prices. So, now I had a single disk that's twice as fast as my IDE disks and more than double the capacity. The last component I needed to upgrade was my graphics card. I had an old 128MB AGP card installed. I did a search on Google and found a great Nvidia adapter with 1GB memory on the card. Now I had a graphics card that's has 6 times the amount of video ram than my previous card. With this strategy I could now use my old PC again. The software I upgraded ran very nicely on my system, and I spend very little on the computer hardware upgrade compared to buying a new system. At some stage, you have to upgrade your PC. When you decide to do that, have a look at the features in the manual of the motherboard, and pay attention to what you can upgrade in the future. Look at the maximum amount of RAM, disk connectors and ports, PCI express slots and CPU type and socket. Check on the Intel site on what CPU are supported for the motherboard and how this will help you with upgrading your PC. Do some research and take your time. This could save you a lot of money in the future. When people do a computer hardware upgrade, they usually just open the PC and start swapping components. You can do that, but at some point you are going to damage a component because of ESD. Electrostatic Discharge is the sudden transfer, or discharge, of electricity from one object to another. ESD is also known as "static electricity." Day to day tasks such as moving our arms, walking on a carpet or combing your hair can create up to 30,000 volts of static electricity. Have you ever felt that shock when you touch someone or some object? That's ESD. The charge then moves from your body to the object. This sudden discharge of static electricity can easily cause a electronic component to fail. CPU, memory, motherboards etc. all have sensitive electric components that can be damaged if static electricity is discharged from you to the component. Don't fear, there is something that you can do to prevent this. Most hardware engineers, working on big servers, use either a static mat with a wrist strap, or they usually carry a antistatic wrist strap with them. Computer Hardware Upgrade. ESD Wrist strap. 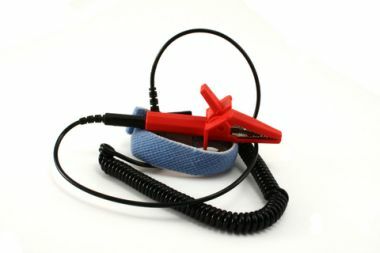 You connect this wrist strap to your computer, or some other device that is grounded, with crocodile clamps (such as the picture above), and put the wrist part around your wrist. This will safely discharge the static electricity to the grounded device. So you cam safely replace components without the fear of damaging them with ESD. Just remember to keep the power cord in the PC if are using your wrist strap and you don't have an alternative grounding device. Don't think that ESD won't affect you. You might replace components for years without any problems and then suddenly, one day, your memory doesn't work, or your hard disk doesn't want to spin up because of ESD. It's a silent killer of components. You won't even know if a component is damaged. The problem might only show up later if you use the PC intensively. Get yourself a wrist strap. It only takes seconds to connect and you will save yourself a lot of headaches in the future. See how you can easily upgrade the memory on your computer. Step by step instructions on how to upgrade your CPU. Get a faster disk and more space to save your music and data. Step by step instructions.